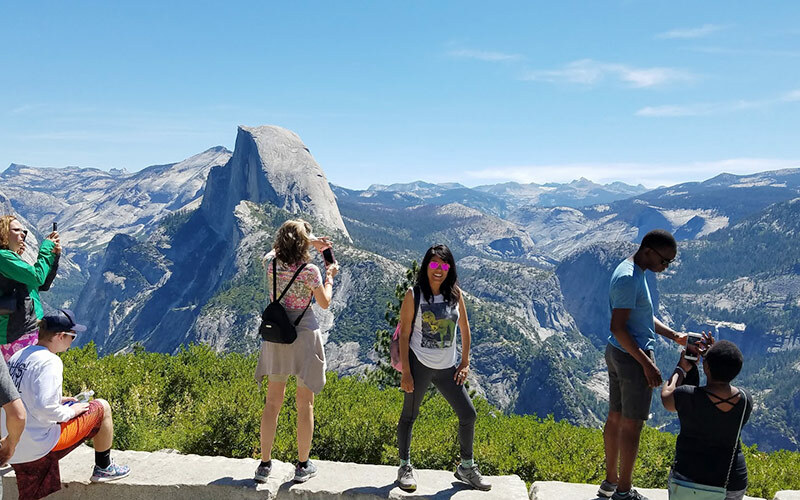 Known as Curry Village up until 2016*, Half Dome Village in Yosemite National Park is a destination that any outdoor enthusiast will want to visit. Beneath the shadow of the iconic rock formation known as Half Dome, the village is surrounded by nature’s splendor and emanates an ineffable quality of nostalgia that will instantly remind you of childhood camp. A huge tourist attraction, Yosemite welcomes more than four million visitors from all over the world each year. And 2018 was the year that my husband, father-in-law and I would be among them. Amazingly, our vacation ended just days before the horrible Ferguson Fire forced the park to close down for a few weeks. Half Dome Village is only one of a few lodging options in the Yosemite Valley, unless you want to set up a tent on a campground and actually rough it. 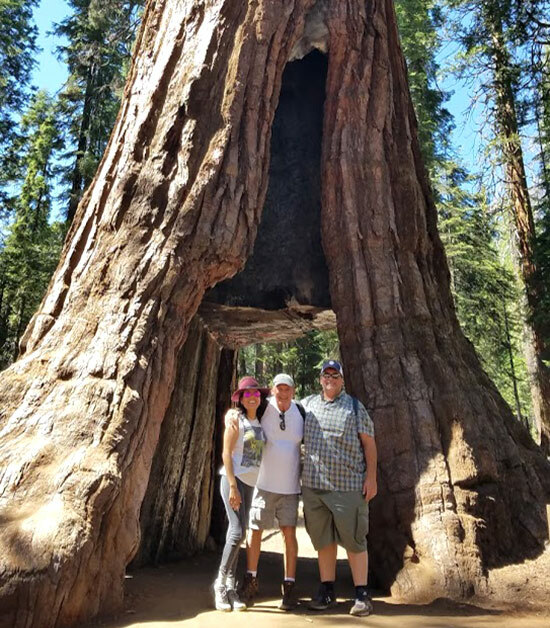 So when it came time to book our Yosemite trip, there were only three options for us — Yosemite Valley Lodge (sold out), The Majestic Yosemite Hotel, formerly known as The Ahwahnee (booked, not to mention way too expensive) and Half Dome Village (eureka!). Because options were limited, we couldn’t book an actual cabin. Instead, we took what we could get, which was a Heated Canvas Tent with three beds. 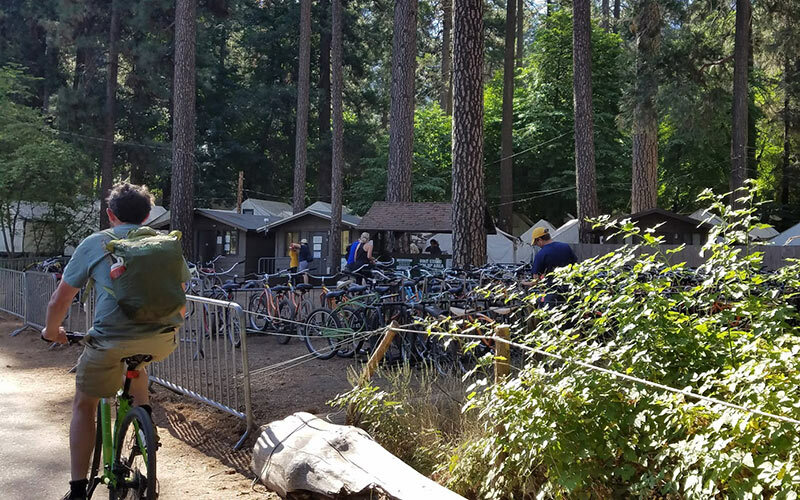 There are about 400 of these elevated tents in Half Dome Village, which are a step up (literally) from regular tents with wood floorboards, shelves and even a little safe. Even though the heaters are not in operation from Mother’s Day through Labor Day, I highly recommend getting a heated tent just for the electrical outlet. We were told over and over again that we would not have an electrical outlet in our tent, but that is only true for non-heated tent cabins. 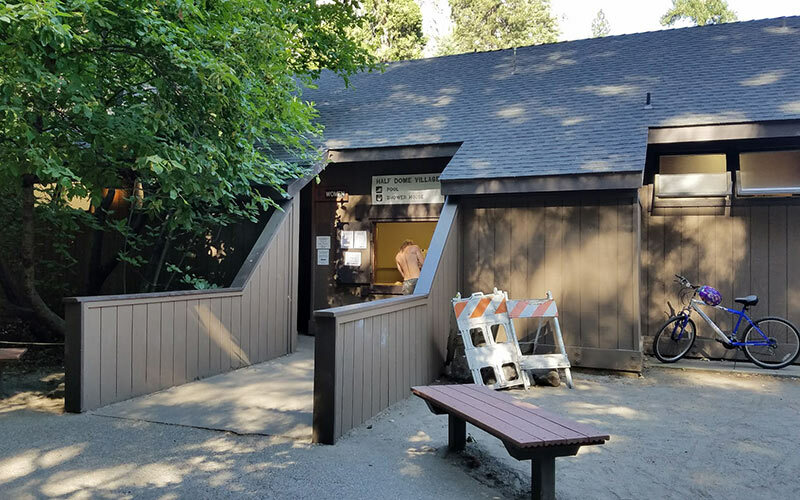 I was surprised that there really wasn’t enough detailed information on what to expect at Half Dome Village, which is about a 45-minute drive from the entrance of the park. As much as we talked to the staff on the phone or researched online, we still had a lot questions before we arrived, especially about parking, phone charging and food options because my husband and I are vegan! 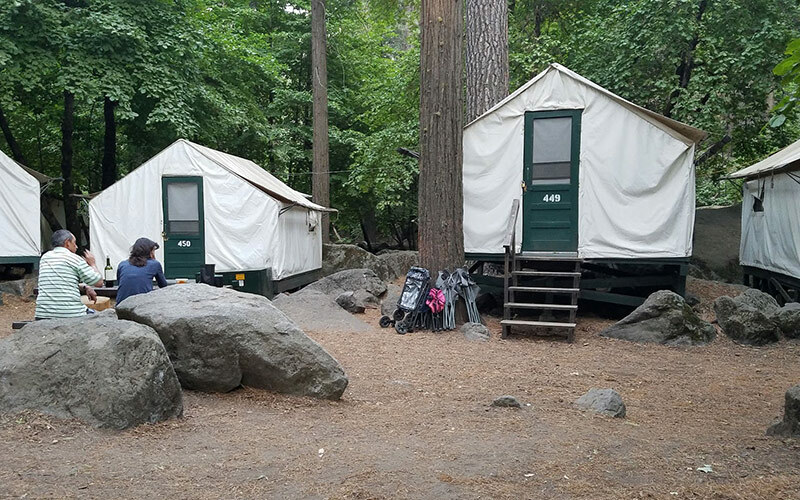 If you are planning a visit to Yosemite and staying in a canvas tent cabin at Half Dome Village, read on for a first-hand account of what to pack and other helpful tips to make your trip as fun, safe and stress-free as possible. *If you want to know the reason for the camp’s name change, check out this National Park Service article. Of course, it all comes down to money … and the park is not to blame. Shame on DNCY— so shady! Bring a pillow and extra blanket, but sleeping bag not necessary. I was also pleasantly surprised that the blankets provided by Half Dome Village aren’t half bad. The material reminded me of a horse blanket — kind of fleece-like and sturdy. Still, if you worry about the cleanliness level of linens when traveling, pack your own blanket. Note: We visited Yosemite in the middle of July when it was 90+ degrees during the day, but it got pretty cool in the middle of the night and I was so glad I had my own ultra-soft plush blanket. I was able to feel cozy every night even though the mattress wasn’t exactly a five-star experience. Not that I was expecting it to be … we were camping, after all! Bring a padlock for the bear box. As exhausting as it was to use the bear box, it worked — no bears! 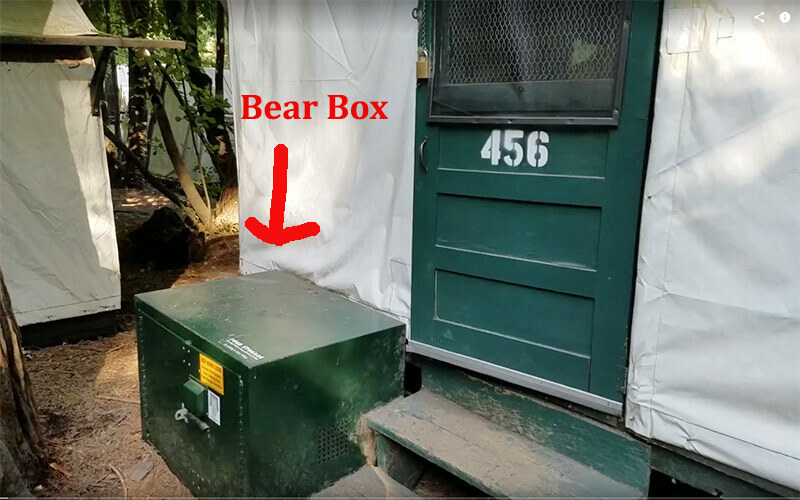 One of the most tedious parts about staying in the tents at Half Dome Village is the bear box. By the end of our trip I was so over it! You have to store all food, drinks and anything with the slightest whiff of fragrance in these boxes. (Lip balm, medication, toiletries, lotion, etc.) Even though they’re located right outside each tent, it’s a hassle to go back and forth and pry those things open. Walking through Half Dome Village we noticed that most people’s boxes didn’t have padlocks, but just in case we bought one at the local market in Yosemite. It’s always a good idea to use a padlock, especially if you have special medications like my father-in-law did. Pack a flashlight and a pair of flip-flops. Whether you’re just walking around your unit or need to hit the communal showers in Half Dome Village, you’ll want to have a pair of flip-flops to avoid any potential germs. Plus, when those 1:30am bathroom breaks call, you’re going to be glad you have a flashlight. Check in early even if you can’t get into your tent right away. If you’re traveling to Yosemite at a busy time of year (spring or summer), then chances are you won’t be able to check in right at 4pm. When we arrived at noon, we were told that some 300 guests had just checked out, so housekeeping would be busy until about 6pm. If this happens to you, check in anyway. We paid in full, got our parking permit and room assignment, so when we returned around 6pm we were able to sidestep the long line of new guests and got our keys at a separate counter. I could tell the other guests wished they had done the same thing. Be prepared to get hawkish about parking. Finding a parking spot in Half Dome Village is a bit of a cat-and-mouse game. You never know if you’re going to get one, at least during the day. That’s because anyone in Yosemite can park in the lot during the day. And if it’s a busy time of year, it will get full. Once evening rolls around though, only guests can use the lot. You simply put your parking permit on the dashboard. Another note about parking: We were concerned that the parking lot was going to be too far away from our tent when we first arrived because we had no frame of reference even after asking the staff and looking online. However, even if your canvas tent is located pretty inland away from the lot, it’s not more than a 7-minute walk to and from your room. Just make sure that if you have any heavy items that you can either roll them or you have someone help you carry them. And be careful with suitcase wheels — the dirt in Half Dome Village ruined the wheels of my brand-new suitcase, so I ended up throwing it away! Don’t even bother with the Wi-Fi lounge. They might call it a Wi-Fi lounge, but I call it the ‘Why Try?’ lounge. 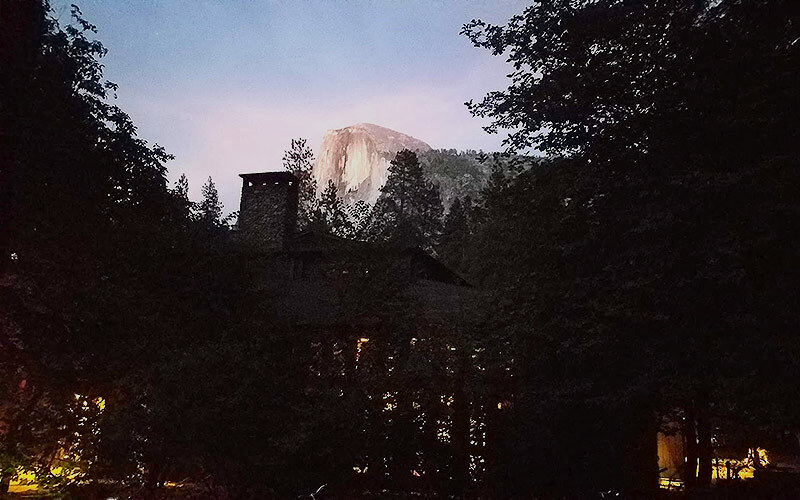 If you have any hope of connecting to the Internet or just getting cell phone reception during your stay at Half Dome Village, you might want to manage your expectations now. I was able to eek out about five minutes of connectivity each day (just enough to post a pic on Instagram or barely call my grandma for her birthday), and it seemed to be the case for about 99% of everyone else. But the whole point of getting out in nature is to just do that, so consider it a digital detox blessing in disguise! When we booked our tent at Half Dome Village, I was told that our unit would not have an electrical outlet. We knew not having a phone wasn’t an option because we were going to be taking so many pictures. To prepare for our cell-maggedon, my husband bought these amazing, life-changing RAVPower portable phone chargers from Amazon, which work wonders! Even though our tent actually had one electrical outlet at our disposal, these portable chargers worked way faster than the outlet and I’m using them even now that we’re back home. They were also quite handy during the day-long tour and provide about four full charges before the device itself needs to be recharged. 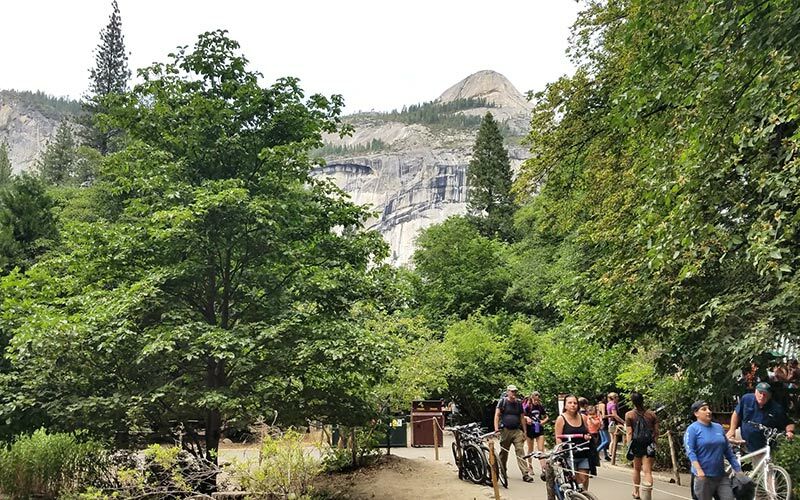 During the busy season (translation: summer), park employees highly recommend using the free shuttle buses that drive from Yosemite Village through the campgrounds and to Half Dome Village and Yosemite Valley Lodge. But I’m not so sure. On the morning of our all-day tour, we went to the shuttle stop closest to the Half Dome Village main office. It was over an hour before our tour started and already there was a throng of people. We waited … and waited … and waited. Every time the shuttle arrived, there was never enough room for us. So we kept waiting. Until we realized that if we waited any longer we would miss our tour that cost us $152 each! We ended up driving ourselves to Yosemite Valley Lodge where the tour group was meeting and found parking. Whew. Don’t let that guy fool you. The tours are awesome and not boring! Seriously, book a tour. At least one. Go to the on the official National Park Service tour page for Yosemite and pick one for your trip. Whether you do a two-hour Valley Floor tour (the smile on my face says it all), a four-hour tour or the full-day Grand Tour, you will not regret it! 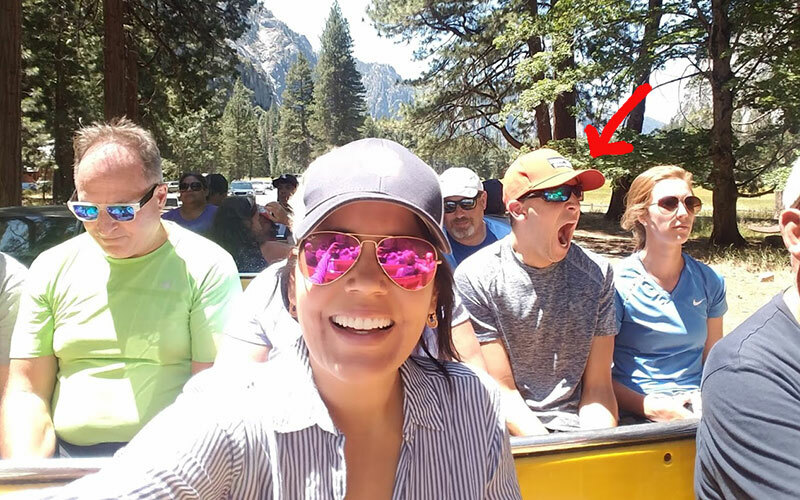 The two-hour Valley Floor tour is incredible because it’s in an open-air tram and nothing compares to seeing Yosemite without any barriers between you and the surrounding landscapes. Yes, it was a sweltering at 90 degrees in full sun, but when that breeze would wash over us or we’d get some shade and look up at those trees, mountains and waterfalls, it was worth all the sweat. As for the 8-hour Grand Tour, that’s inside a big tour bus, so you don’t get the open-air experience. However, you get to see everything you would ever want to see in Yosemite and there are plenty of stops. You go through the Valley floor and up to Glacier Point, which is an absolute must, then over to Big Trees Lodge (formerly The Wawona Hotel) for lunch, and then take an amazing trek through the Mariposa Grove to see those stunning sequoias, including the famous Grizzly Giant and California Tunnel Tree. We even saw a bear while walking through the meadow and again at the end of our tour! I admit those hairpin turns on the way up to Glacier Point freaked me out, but our driver William “Bill” Fontana is not only an incredibly skilled driver, but this guy is a total raconteur. Bonus: The tour bus has charging outlets behind each seat, so you’re all set even if you forgot your phone charger! The communal showers aren’t so bad. Because we were unable to book a tent that had its own bathroom, we had to use the communal showers. I was not excited about this before arriving, but I soon realized it wasn’t that bad. Now, when I say communal shower, I don’t mean you have to stand around naked around other people. I just mean that the shower isn’t in your own tent. 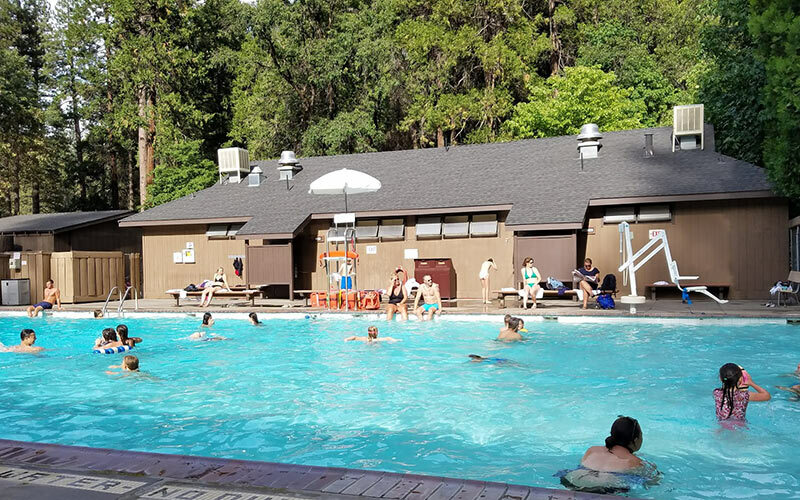 The showers at Half Dome Village’s pool are surprisingly accommodating and clean. Along with towels that you can get from the staff at the pool entrance, there are lockers and individual showers with private areas where you can undress and get dressed. It very much reminded me of the summer camps of my childhood and it was actually quite nostalgic and fun to ‘rough it’ the way I did when I was younger. There are also single shower facilities throughout the camp, but I preferred using those at the pool. No need to bring towels, shampoo or body wash. If you really like to pack lightly, you can leave the towels, shampoo and body wash at home since the showers at Half Dome Village supply these. While the towels are pretty small, you can always ask for more. As for the shampoo and body wash, there is no brand on the giant dispensers, but it does say that they are natural, biodegradable and free from animal products. I think that’s pretty awesome. Although I did use my own face soap and conditioner, it was nice not to have to rifle through my bag to find my travel-size shampoo every time. Don’t worry if you’re vegan. 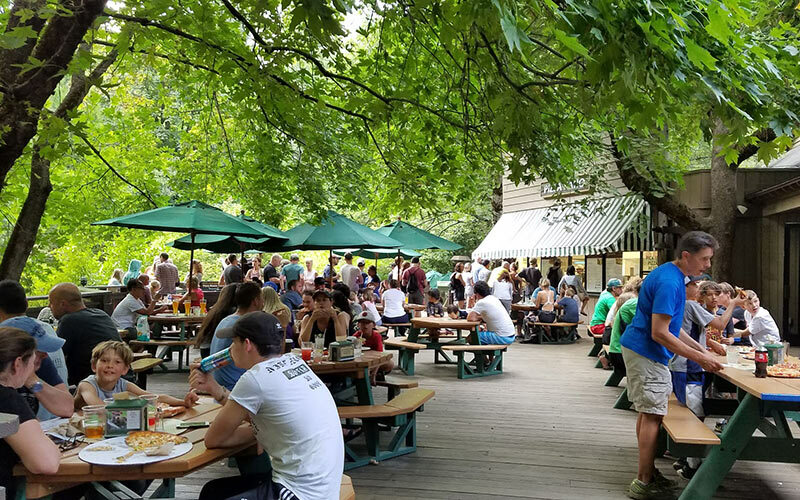 The outdoor food court at Half Dome Village – we constantly smelled pizza but couldn’t have any! When planning our trip to Yosemite, food was top of mind for me and my husband. Following a vegan diet isn’t easy when traveling, but thankfully there were enough dining options at Half Dome Village … if you don’t expect much variety, that is. We ate burgers EVERY DAY! Along with the black bean burgers and chips at Meadow Grill (we couldn’t get the fries because they’re cooked in the same oil as non-vegan items), you can find vegan options inside Half Dome Village Pavilion, which has a salad bar (dressing options are olive oil, balsamic vinegar, lemon juice) and daily specials — we had a tasty tofu vegetable stir-fry and pasta marinara one night. There’s also a grocery/gift store, which has a fair amount of vegan options, including Amy’s vegan breakfast burritos that you can nuke in the store’s microwave ovens. 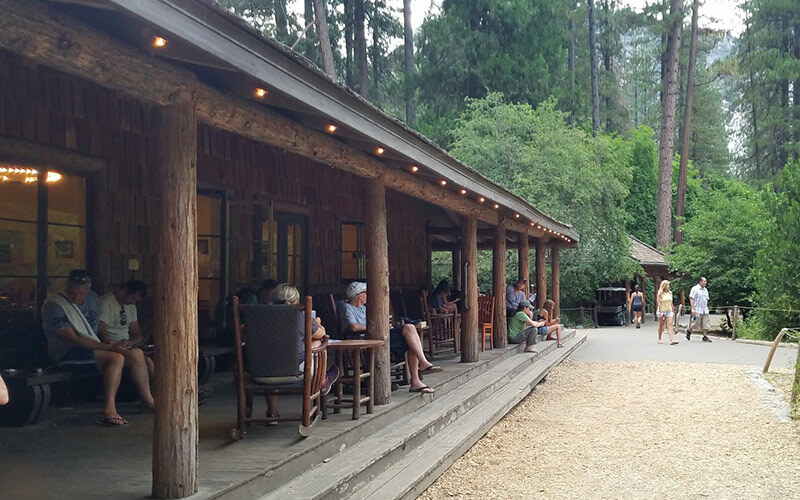 Another great option is the main dining hall at Yosemite Valley Lodge. They actually have Impossible burgers! All in all, we genuinely enjoyed our stay in the tents at Half Dome Village. But would we do it again? The bear box and no-bathroom-inside-the-tent might be deal breakers for a repeat visit, but we are so glad we had the experience. When traveling, my husband and I tend to focus on how nice the hotel room will be, but staying in the canvas tents reminded us that this kind of trip is not about having all the amenities of a resort — it’s about being out in nature and staying outside your room as much as possible. I hope this list is useful for you. I know it would have been helpful for me before our trip. If you have any questions or info that you think would help other travelers, please leave a comment below. Would love to hear from you! For more resources, check out the official website for Half Dome Village in Yosemite. I love Yosemite but have never stayed at Curry Village now known as Half Dome. Thanks for the tips I will be sure to use this guide for my next visit.